Even if you've never had the joy of working on a 3D printer, you've certainly heard about them on the news, among your more creative colleagues, and in other various snippets. For those in the 3D printing circles, it's well known that the most common practice of creating models, involves either scanning your own designs for 3D conversion, or by using 3D CAD software to create a 3D Printable model. If it's a matter of trial & error, creative experimentation, or even early prototyping, online resources will more than suffice when it comes to finding a design database. Thingiverse has established itself as the reigning champion among popular 3D image databases, and many CAD designers and budding designers find it very useful. Of course, despite having such an impressive library, it's completely understandable that not every conceivable design is going to be available. For those who prefer a more "from-scratch" approach, some rather impressive new 3D model design software has been introduced to help expedite the design creation process, while improving the quality of finished 3D printed models. One that's garnering a lot of attention, is Sculpt from Cubify. It's been described as 3D printing's answer to photo editing software, as it for the first time allows designers to not only create highly original designs, but it also provides the freedom and convenience of making modifications to past or current projects. Sculpt retails for just under $130, which is an affordable option when it comes to 3D CAD software. Sculpt is intuitive and user friendly. With Sculpt, you don’t need to be a seasoned CAD designer, or possess great knowledge of thermoplastics or 3D print technology in order to create 3D printable CAD models. The setup is quick and easy, the menus make it very easy to locate and use tools, as well as make minor adjustments, alter specific areas, modify dimensions and many other actions. Keep in mind that this is something that's best used in a desktop 3D print setting. Don’t expect the ultra-fine detail you would get from a professionally-designed rapid prototype, especially if you're new the process of using advanced desktop or 3D printers. For what it costs coupled with what it can do, we think you'll find Cubify Sculpt fun and somewhat addictive… especially as you get more and more comfortable with its features. While products like Sculpt and others serve as a wonderful way to create 3D printed models and concept designs, professional 3D printing is still widely regarded as the benchmark for creating exceptionally-detailed rapid prototypes and functional machine parts. 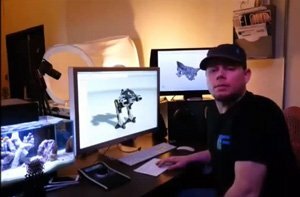 If you're a manufacturing company or engineering firm that relies on 3D CAD for new product designs and concepts, Finnovation Product Development offers a full spectrum of superior quality, professional 3D printing and rapid prototyping services that gives you a competitive advantage over the competition. Contact Finnovation to obtain more information about 3D printing in Buffalo, Rochester and Syracuse New York. Using the latest in 3D printing technology and 3D CAD software, Finnovation Product Development will provide you with functional parts in days, not weeks.